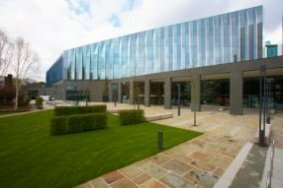 This spectacular Business School can offer excellent conference and events facilities right in the centre of Manchester. Situated at the heart of the Manchester Campus it is a perfect new venue for large conferences and events requiring multiple facilities. It has seven floors of stunning flexible space, beautifully presented under a stunning glass atrium. Through the main entrance is a generous reception area. Two impressive large, ground floor atriums perfect for hospitality and exhibitions space lead off from here. There are three large lecture theatres on the ground floor (250) and three smaller theatres (120), all easily accessible from the main atriums. On the upper floors further meeting space is available in cabaret (60) and theatre style (60) and there are multiple glass meeting rooms of varying sizes and capacities. Casual contemporary furniture appears throughout the building perfect for informal meetings and there is a café with outdoor terrace leading from the dining atrium.